Brenda shares some photos from Carroll County, Tennessee, taken on a recent laundry day. We’ve had a lot of posts on the Ethridge, TN Amish, but not much from the other communities in the Volunteer State. There are only a few other Amish in Tennessee, and they are quite small settlements, so nice to hear from a lesser-known corner of Amish America. On to the laundry. You can see a few of the pieces that go into getting clothes clean when you don’t use public electricity. Yes Reneee, I would love to have your recipe too….always wanted to make my own laundry detergent….I have heard it is much cheaper…. How is homemade laundry soap made? cindy send me your e-mail i will send you how i make laundry soap..
Renee, I joined the Amish in making about 50 gallon of the laundry soap, and I really doubt it would be something us ‘English Folks’ would want to attempt. 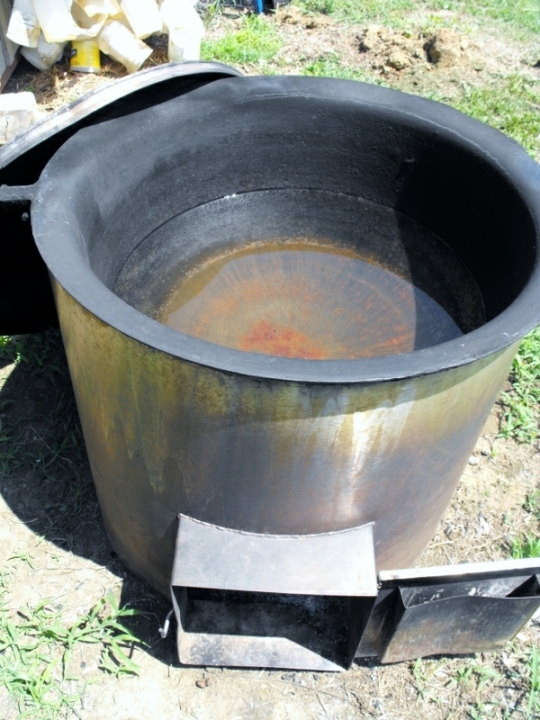 From what I can remember, outdoors in several cast iron kettles over an open fire, they used: Lye, Borax, strained bacon/meat grease, that was kept in a 5 gal. bucket, saved just to make the soap, water, lard and some ‘store bought washing powder, for a nicer fragrance. After it is cooked and stirred with a big paddle, it was cooled a little, then poured into a mold (the lid of a cardboard box) which was lined with some type of waxed paper. It had to ‘cure’ for several weeks. After it cured and ‘set up’, It is cut into about 2″x4″ bars. I’m not sure what was used to shred it, but the 5 gallon bucket I was given, looks kind of like shredded coconut. When it is time to make it again, I’ll try to get some photo’s. They make the Laundry Soap twice a year and it is pretty much an all day chore. Sounds about like we made it except we poured ours into 2X8′ frames made of about 2X4s (on edge) laid on the basement floor (concrete) over several layers of newspaper. And when it’s dry the “cakes” get grated on a regular kitchen grater. Could you please share your recipe with us too ? I like that your’s has no LYE in it….. I use the same recipe. I have 5 kids so this is such a money saver at pennies a load and very easy to make. My family is not Amish but, we made soap for laundry and cleaning. We also used it for bathing. You are right it is a all day job, and lot of hard work. Standing over a hot pot and stirring the mixture all day is not easy. We lived on a farm grew most of our food and made do with what we had. Growing up in the 50’s and 60’s was not easy but it made us better people and kept us out of trouble. The Amish are very special people. They live a very simple lifestyle however, in doing this it is a very labor intensive way to live. My hat is off to them. do yall want to powder version or liquid? I am old enough to remember my mother using one of the Maytag wringer washers. We also had the two sinks, one for the first rinse and the second for the final rinse. I would always like to help her, but she always cautioned me to keep my hands away from the wringer. There’s a Maytag up in the loft here – in excellent condition. I am trying to persuade the housemate to let me have it to use. He figures he can get a good price from the Amish out in Kalona, though. I am left with the old Kenmore in the basement. 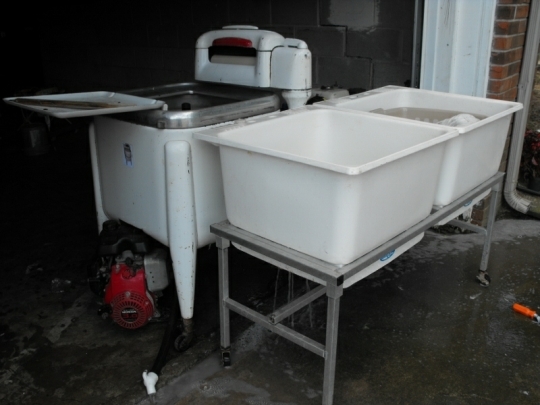 I miss my washtubs and wringer! I prefer the new washers to the older ones, but I do like hanging clothes outside. We aren’t allowed to hang clothes out in the apartment complex I live. It’s kind of sad. I haven’t hung my clothes outside since my kids were small. My Mom always hung her’s outside unless it was storming. One year we had the whole line of clothes stolen and found half up the street on a front lawn. Always felt the clothes on the line felt stiff, but later found out this was due to using a dryer at times. If only wash and hang out, the clothes are never stiff. And yes the fresh smell from hanging outside is nice. (except when there is a large cow farm close by) then the clothes stink from the cows. I’ve hung out my clothes for years. I throw them in the dryer for a few minutes and it softens them. After we sold the farm and moved to town, I still hang them out. Nobody has complained. My mom used a set-up like the picture shows when I was little. I always thought it was neat to use the wringer! I used to hang out all my clothes when I was younger and still had kids living at home. The clothes do smell so much nicer when hung out. But boy was it ever cold hanging them out in the Winter months. They would freeze almost before you could get them on the clothes lines. And they smelled really good during that time too. I didn’t have a old Maytag but I had a really old top loading washing machine. Had to sit on it to keep it in place when it was spinning the water out of the clothes. But mu Mom had one of the old Maytag’s and also had a wash board too. Thanks for sharing, Brenda. Erik, very good post to share. You are very welcomed, Carolyn B. I plan to make more photo’s from time to time, and hopefully Erik will pass them along, also. 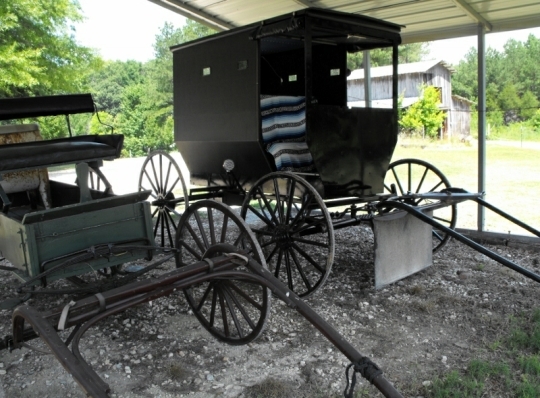 Today the Amish lady where I took these photos was canning cabbage in the big kettle you see in the pictures. She had 30 filled quart jars on a rack inside the kettle. I found that quiet clever. Sure keeps the home cooler inside. When it comes to laundry, I still use my outside clothesline. It save on the electric bill, and I love the crispness and fresh, clean smell of my laundry. I hope everyone enjoys the pictures! Last fall when our washer broke, we purchased a wringer and tubs. I wash our clothes in the bath tub, agitating them with a thing that looks like a plunger, then use the tubs for rinsing twice and wringing with the hand crank wringer. I occasionally used our dryer instead of the clothesline, until it broke a couple months ago. It’s a lot of extra work, but it saves about $50 a month, gets our clothes cleaner, and generally I find the work enjoyable. Hanging wet clothes on the line in frigid weather being the possible exception. I’m a little embarrassed when people come over and see my set up in the bathroom and decide that I’m totally crazy. Perhaps I am! Carol, I don’t really have a problem with birds, thank goodness. That would be a nightmare…haha. Carol, I wonder too…..there’s always bird poop everywhere I live..on the sidewalks, driveway even on my porch……this summer seems to be worse…..2 Robins were at my front glass storm door waking me up every morning pecking on the glass….and leaving their calling cards with berries too !!! !How gross…..I’d have to go out and scrub porch every day……is anyone else having this problem??? Or is it just an OHIO thing ????? You’re right, Carol, birds can be a problem. I am a bird lover with a number of feeders and birdbaths on my quarter acre suburban “homestead”, and I am sure I’d have bird droppings galore if I started hanging clothes outdoors again (used to do it when I used cloth diapers 30+ years ago for my kids, and lived elsewhere–fewer trees/birds). I found that you needed full sun and a nice, stiff breeze for clothes to dry “soft”—much the same as using an electric/gas clothes dryer. Fabric softener (liquid) helped, too. My mom used to hang clothes in the city, but the commercial laundry smokestack next door would leave soot on them—she would try to do laundry early in the day, before the boilers (coal heated) were fired up. A local area nearby (sort of a private homeowners “town”) BANNED CLOTHESLINES—this was 23+ years ago—they thought it made their la-dee-dah area look “unkempt”. I don’t know if they ever lifted the “ban”—how “uppity” of them! This clothesline ban affects thousands of communities nationwide, too many to list. Some cities in Canada have banned clotheslines as well. Generally, HOAs nationwide have banned clotheslines. A spokesman for one HOA said that clotheslines lower property values by 15%, but he did not offer scientific evidence of this. People nationwide have begun working to overturn the bans. Canton, Ohio has a ban on clotheslines, but residents, beginning in 2009, are pressuring the city council to reconsider. In the last year or so, there has been a resurgence of interest in clotheslines. A couple of lifestyle magazines such as “Real Simple” have featured articles on the joys of an outdoor clothesline. About a year ago I built a clothesline. One pulley up in a tree, one on a post just off the deck. I then inherited an old “Speed Queen” washtub from my wife’s Grandfather. 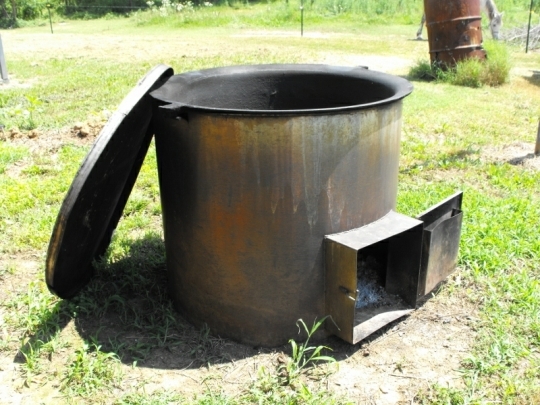 Basically, it’s a square galvanized washtub on white metal legs with a drain/hose attachment. Paired up with the plunger-like “Breathing Washer” and two other tubs it works great. After I recently spent a lot of money on new clothes (I haven’t gotten new clothes in about five years and the old ones were starting to look, well old) I try to only hand wash them. They stay new so much longer. It wasn’t until I started all this that I realized how much a washer, and especially a dryer, destroy your clothes. You can do a full load and have it up on the line in about a half hour. Most of it will dry in half a day. That’s without a wringer, just a twist and drip drying. …and they smell so much better. Grate the bar of Zote using cheese grater(I have a spare just for this,I do not cook with it). After Zote is grated add in the remaining ingredients. Blend until a fine powder is formed. I make a huge batch and store in an ammo box my son painted up for me. Hope to make some soon…. I grew in Huntingdon,Tn. They would sell peanut brittle and hard rock candy around Christmas time in town.